Why do you need a Power Commander? On a completely stock bike the fuel curve is usually fine at 100% throttle, however at the lower throttle openings the fuel curve is usually lean. Installing a properly mapped Power Commander on a bike like this would make no improvement at 100% throttle, therefore no peak horsepower gain. However in the lower throttle openings where the fuel curve was lean, the bike will run smoother, cooler and have better throttle response providing a more confident ride. If you did before and after part throttle roll-ons i.e. 20% you might see a 30% increase in power. 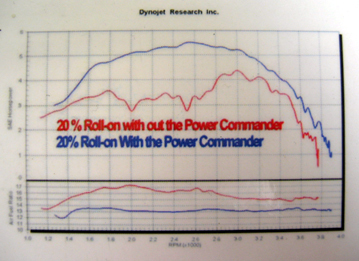 The more modifications change the shape of the air curve the more improvement you will get from the Power Commander. Stock bikes can benefit from a Power Commander, if the bike has modifications it needs a Power Commander, which is why most exhaust manufacturers recommend it. If a customer has a fuel injected bike he needs a Power Commander. If you change the air flow of a carburetted bike for different pipes, air box, cams etc. you would need to change the jetting. With fuel injected bikes, you must adjust the fuel curve electronically, and that's where the Power Commander comes in. With a Power Commander equipped EFI bike you have more control over the fuel curve than with carburetion, i.e. you can improve deceleration popping without affecting idle, you can not do this with carburetion. With a Power Commander on your bike, it will run smoother, cooler and have a better throttle response. 1. Improves horsepower, throttle response and rideability. 2. Reduces running temperatures and pinging.